We have a couple more weeks to wait for Realtime Gaming's new Megaquarium slot game. When the exotic new game arrives in February, Golden Euro will offer a bonus that includes free spins. In the meantime, they’re giving a Bitcoin bonus for the Nova 7s slot. Megaquarium is alive with brilliant tropical colours and the underwater excitement of a coral reef, It has a wild Clown Fish that doubles wins and three bonus features that award bigger and bigger bonus prizes. It arrives February 15th at Golden Euro Casino. 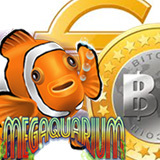 Megaquarium’s Free Games symbol triggers up to 7 free games with prizes doubled. On the final free spin, payouts are up to 100X. Bonus Symbols on the final free spin trigger Bonus Games, where the right reel is all Wilds. If Super Games symbols appear during Bonus Games, 3 more free spins with 5X payout begin. Hitting Mega Games symbols during a Super Game spin begins the Mega Bonus round where the fourth and fifth reels are all wild Clown Fish. Bitcoin bonus now available -- free spins on Nova 7s slot. Golden Euro has always catered to players using Euros. Now they've introduced another currency: Bitcoins. They’re offering a special bonus for players that choose to make their deposits and withdrawals through their Bitcoin account. “Bitcoins provide a safe, secure and convenient method for making deposits and withdrawing winnings,” said manager Robert Miller. Bitcoin banking at Golden Euro. The new Nova 7s slot is exploding with special features including an Expanding Wild and a Scatter that triggers up to 7 free spins with 7X payouts. You'll find hundreds more games from RTG at Golden Euro, all played in Euros. You can play them on your laptop or desktop computer or on your smartphone or tablet.